Cytoscape’s capabilities are not fixed. They can be expanded with apps. They can extend Cytoscape in a variety of ways. One app can have the ability to import data from an online database. Another app could provide a new method for analyzing networks. You can install apps after you have installed Cytoscape. Most apps were made by Cytoscape users like you. If you’re familiar with Cytoscape 2.x, you probably know that Cytoscape apps were called plugins. Starting in Cytoscape 3.0, we are calling them apps. Cytoscape 2.x plugins cannot be used in Cytoscape 3.0. You can install apps through the App Store or within Cytoscape. In this section, we’ll talk about installing apps through Cytoscape. You can learn how to install apps through the App Store here. 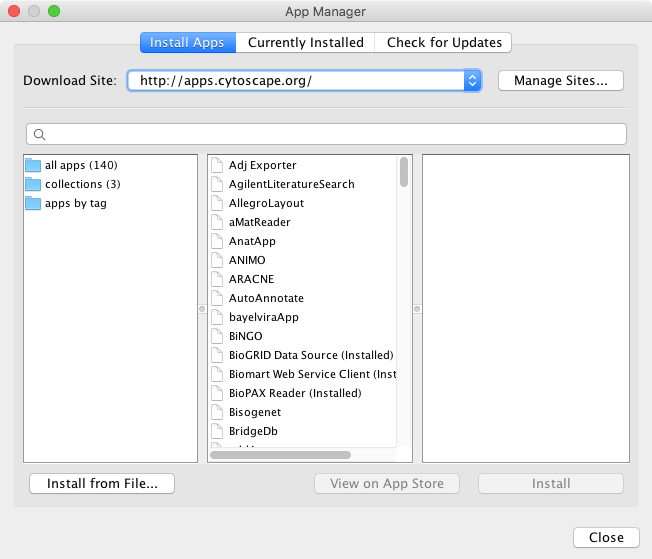 To install apps within Cytoscape, go to the menu bar and choose Apps → App Manager…. At the top of the App Manager window, make sure you have the Install Apps tab selected. If you know the name of an app you’re looking for, enter it in the Search field. The App Manager will list the apps whose names or descriptions match the Search field in the middle panel. If you’re not sure what sort of app you need and want to see everything, click the all apps folder. In the middle pane, you will see a list of all the apps. If you want to install a collection of apps for a specific use case, click on the collections folder. This will display the available collections in the middle pane. A collection is simply an app that installs other apps for a specific use case. If you have a general idea of what sort of app you’re looking for, double-click on the apps by tag folder, then click on one of the tags that interests you. The apps with that tag are listed in the middle pane. When you click on an app (or collection) in the middle panel, the App Manager shows its short description and icon in the right panel. If you want more information, click the View on App Store button on the bottom-right. If you want to go ahead and install, click the Install button. If you’ve downloaded an app to your computer, you can install it by clicking the Install from File button on the bottom-left. Uninstall an app. This deletes the app from your computer. If you want to reinstall the app, you will have to find it again in the Install Apps tab or find it in the App Store site and reinstall it from there. Disable an app. This temporarily disables the app. The app stays on your computer, but Cytoscape does not load it. You can enable the app by first selecting the disabled app in the list, then click Enable. Note that uninstalling or disabling a collection will not uninstall or disable any apps installed by the collection.